'Congratulations'! Earth Has Just Reached The Point Of No Return! ‘Congratulations’! Earth Has Just Reached The Point Of No Return! How many videos, articles, research papers, documentaries, activists tried to warn us? How many options we had to prevent THIS? And some people still don’t even believe that the climate change is VERY real and CO2 levels are off the charts! Well, ‘congratulations’ people, Earth has reached the point of no return! What’s so terrifying about this number? 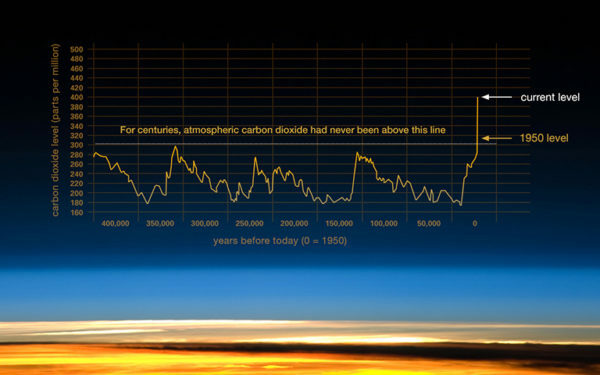 For several years now, scientists have been warning us that if atmospheric carbon were allowed to surpass 400 ppm (parts per million), it would mark a serious “milestone.” One from which we won’t be able to return in the time required to fix this mess. Scripps notes that numbers are hovering around 401 parts per million! Extinction. While difficult to estimate, extinction rates have accelerated to 1,000 times their rate before the existence of modern Homo sapiens. The World Wildlife Fund guesses 10,000 species could become extinct every year. Due to climate change, The Nature Conservancy suggests one fourth of Earth’s species could be on their way to extinction by 2050. Food chain disruption. Nature has a system in which, if one thing is disrupted everything feels the shock. In the Arctic, for example, rising ocean temperatures are impacting the growth of sea algae, which in turn, deprives populations of zooplankton, cod, seals, and polar bears of vital nutrients. THIS is just one example of MANY! And with 10,000 species getting extinct every year it’s undeniably worse. Ocean acidification and coral bleaching. The planet’s oceans are constantly absorbing excess CO2, causing their pH to decrease, literally acidifying the water. Rising sea levels. By 2100, approximately 13 million people in the US are projected to lose their homes due to rising sea levels. In some parts of the world, such as the Pacific Ocean, that’s already started to happen. Pollution in cities, health problems. With higher levels of CO2 everything and everywhere gets more polluted. This CO2 pollution causes health problems for anyone who needs air to survive. CO2 levels will get so high that we’ll have to wear masks, all the time! New humanity. We’ll have to evolve in a certain way so we can survive in this polluted environment. So get ready for transhumanism and merging your body with a robot! And all of this could have been avoided if people reduced driving their freakin’ cars for just a tiny little bit and drive a bike. Or if the majority of the world stopped supporting the meat industry. Or save on electricity. Or save on water. Or reduce the number of factories. Reduce warfare. Or plant more trees… but it was easier to blame than take an action. If there’s an inkling of a silver lining here, it’s that scary numbers could scare people into action. If not, than we deserve to be extinct, or robots, or leave this beautiful planet and find a different ‘piece of rock’ to ruin.